If your future includes a move to Morro Bay, check out Meathead Movers! Our professionally trained student-athlete movers, moving concierge, and princess packers are prepared to get you safely moved into your new Morro Bay home. When you make your move to Morro Bay, be sure to contact Meathead Movers. No matter what type of moving service you need, our student-athlete movers are ready to handle all your moving needs. Famous for its beautiful vistas and coastal location, Morro Bay, California, is one of the state’s loveliest beach communities. Morro Bay is located just northwest of San Luis Obispo on Highway 1, better known as the Pacific Coast Highway. The city was established in 1870 and originally acted as one of the California coast’s major ports. Individuals moving to Morro Bay will enjoy a leisurely and relaxed lifestyle. Meathead Movers has over a decade of experience in the area and is pleased to be your Morro Bay movers of choice. Visitors to Morro Bay are greeted by world-famous Morro Rock, a volcanic plug standing nearly 600 feet tall. The beautiful bay is home to a variety of protected birds and marine wildlife. Individuals who enjoy the outdoors can take advantage of the excellent water sports and fishing opportunities on the bay. During good weather, small boats and leisure craft can enjoy a day on the water and use the channel and harbor. In addition to the bay, the area also features remnants of an early Chumash Indian settlement. Native artifacts have been found along Morro Creek and in surrounding areas. An ocean lookout and small park off the Pacific Coast Highway serve as a picnic area and resting place for tourists year-round. At Meathead Movers, we know that you want to pick your Morro Bay movers carefully. We are proud to offer the best customer service available. We have experience in local, commercial, and long-distance moves. All our movers are clean-cut drug-free student-athletes. When they aren’t carrying your possessions, all our movers jog to make the most of your precious time. We offer incentives to our employees for providing world-class customer service and taking great care of your possessions. Our friendly office staff will help you during every phase of your move. We use a proprietary software program to plan and track your move, ensuring that your possessions arrive at your new home on time. If you are moving long-distance, we also guarantee that the same movers will be with your belongings from the beginning of the move to the end. If you need help packing, our Princess Packers are also available to provide extra packing assistance. We also offer a concierge service to connect you with local service providers such as plumbers, electricians, and even babysitters in your new area. We believe that moving to Morro Bay should be a pleasant and stress-free experience, and will work hard to ensure that. Contact us today for a free, no-obligation moving quote. 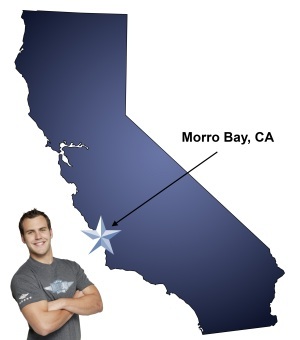 We look forward to being the Morro Bay movers that you choose for all your relocation needs. Moving to Morro Bay? Here are some helpful resources. View more Morro Bay resources. Knowledgeable, professional and efficient!! The crew was on time and ready to work. They finished ahead of schedule and did a terrific job. Highly recommend!